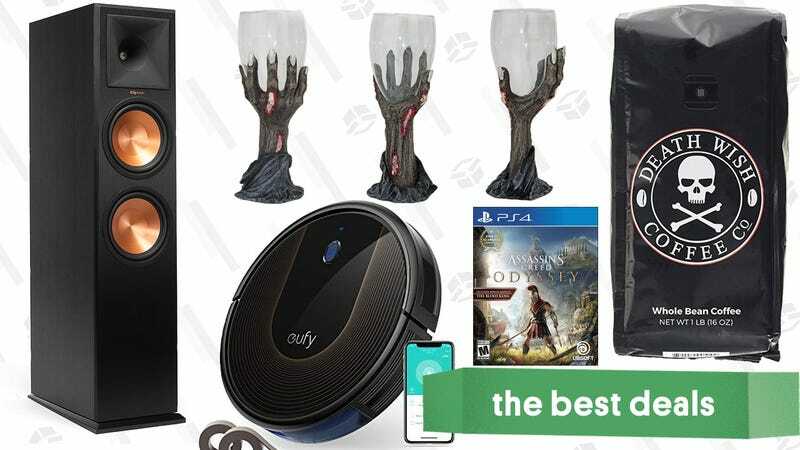 A one-day coffee sale, Halloween decorations, and Anker’s newest robotic vacuum lead off Monday’s best deals from around the web. I don’t care how great your sound bar is; it’ll never sound a good or as loud as a couple of floorstanding speakers attached to a good receiver. This Klipsch RP-280F doesn’t come cheap, but today’s $347 price tag is an all-time low, and $130 less than usual. In addition to the two standard USB output ports, the USB-C port works as both an input and high-speed output port that can charge a 12" MacBook at full speed, or raise your Nintendo Switch’s battery level while playing it at full brightness. It’s pretty huge, but 30,000mAh should be enough juice to get you through even the longest flights. Just be sure to use promo code AUKEYK97 at checkout to get it for $53. We’ve seen wireless number pads before, but this is the only one to my knowledge that uses mechanical key switches. And the ultra-clicky blue ones at that! Now you can pretend to be a badass hacker while you loudly pound numbers and formulas into spreadsheets at work. Get it for $14 today with promo code M3G2BQK3. It doesn’t have smart apps or HDR, but even for a barebones 4K TV, $250 is a terrific price for a 55" set. I probably wouldn’t use it for my main home theater, but it’d be a great secondary TV. Anker’s Roav brand, the manufacturer of an incredibly popular dash cam, also makes some seriously smart car chargers. This one’s only $16 today. Mounting your TV to the wall is great in theory, but perhaps a little less appealing when you remember that you have to put your cable box, game consoles, and other connected devices somewhere. This wall-mounted shelf though give you a great spot to do just that, and it’s only $16 today. I’m willing to bet that you’re using a surge protector that’s way too old to still be effective, so grab this 12-outlet Belkin while it’s on sale for $17 after clipping the $5 coupon. It even has coax and telephone protection, if you, uh, have a landline phone. RAVPower’s HyperAir Qi charging pad is one of the few models out there to support the fastest-possible 7.5W iPhone charging, and you can save $10 on it today with promo code GoWirels. I’m old enough to remember when a 128 megabyte SD card would cost like $50. Now, you can get 1,000 times the storage, on a physically smaller card, for just $26. Amazing. Amazon’s kicking off October with a scary-good deal on Halloween decorations, today only. Gargoyles, tree spirits, skeletons, and a bunch of other spooky stuff is included, but just remember, the prices will rise along with the moon. Before you know it, it’ll be time to put lights, laser projectors, and other decorations out in your lawn, so it’s worth grabbing a few of these outdoor outlet timers while they’re on sale for $7. They’ll automatically cut power to whatever’s plugged into them after a preset amount of time, or you can put them in dusk-to-dawn mode, and let the built-in ambient light sensor do the job for you. Anker’s Eufy RoboVac line has been a hit with our readers, to say the least, and now you can save $50 on their newest model, complete with smartphone and Alexa support. The RoboVac 30c is the same size as the RoboVac 11s (which is to say, it’s very thin), but has stronger suction (1500Pa vs. 1300, and for comparison, the old RoboVac 10 only had 400), and includes guide strips that you can lay down anywhere in your home (like in front of cords on the ground) to warn the vacuum to steer clear. The RoboVac 30 has been out for a few months, but the 30c adds Wi-Fi connectivity, allowing you to start or schedule it with your phone, or even by yelling at your Amazon Echo. The 30c just launched at $300, but our readers can save $50 today with promo code EUFY0050. Rare is the apartment kitchen that includes enough storage and counter space, but you can add your own with this attractive Whitmor baker’s rack for just $60 from Amazon, which is as cheap as we’ve seen it this year. You can read more about the water-based sunscreens in my recent review, but spoiler alert: They completely changed my perceptions about what sunscreen can be. Amazon’s currently offering the best price we’ve ever seen on the SPF 50 version ($26 for three bottles), or if you can get by with SPF 30 (I’m jealous), you’ll only have to pay $16. It’s still fairly expensive as sunscreen goes, but once you try it, you’ll never buy anything else. We wouldn’t usually post a deal to a single pair of sunglasses, but these metal frame, polarized Carreras legitimately sell for $80-$100 elsewhere on the web, but are marked down to $42 at MassDrop today. Today’s $240 deal is one of the best prices we’ve ever seen, so be sure to get this deal before it’s swoled out. The Columbia Wilderness Jacket is REI Outlet’s Deal of the Day so you can snag one for just $70. It features their omni-heat technology which helps to retain heat without turning you into a walking sweat lodge. It’s lightweight and 100% polyester, with zipped hand pockets and a zipped front chest pocket, and is available in two colors, carbon and cypress. Men’s version only. Haven’t read the super popular Ghost in the Shell mangas yet? This collector’s box set includes three large-sized hardcover volumes, plus a collectible lithograph by creator Shirow Masamune for $48, which is within a couple bucks of an all-time low. Don’t let the live action movie ruin the series for you, this is better! Update: Only three days left to preorder, and the campaign is closing in on a half million dollars raised. Crash Bandicoot? On a Nintendo console? What is going on here? The remastered N. Sane trilogy is just $20 today on Switch. Even if you’ve played the originals, this is a really good remaster. LEGO’s Star Wars advent calendar only just went on sale for 2018, but Walmart’s already taking $7 off its $40 price tag. As always, it features 24 tiny Star Wars-themed LEGO gifts, including brand new ones for 2018 like a snowman in a Rebellion helmet, a Rose minifig, and tons of miniaturized spaceships and speeders.